Vatican tours booked through me allow you to see exactly what you want, for as long as you would like, when you want. Although I no longer personally provide tours in the Vatican, my friends do and I can connect you with them. There is only one way through the Vatican but there are choices along the way, not everything is compulsory. My tours let you pick and choose what you would like to see. Other companies just show you established routes. I charge per hour and I calculate that based on the average amount of time it takes to see that part of the Vatican. You can find descriptions of the various parts of the Vatican in the menu and then you can choose what you would like to see when you book below. All the tours I organise use skip the line tickets for the Vatican so you will experience no line or queue for the Vatican. 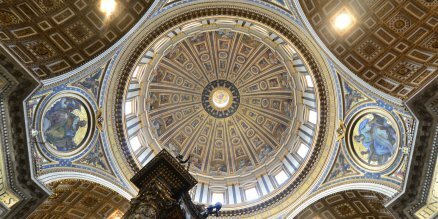 If you want to see the Vatican properly and are genuinely interested in what it has to offer, this site is for you. If you just want to ‘do the Vatican’, I would recommend a standard tour company instead. In order to book a tour through me, English must be your native language and you must have full walking abilities; tours walking slow or taking breaks to sit down are no problem at all. Between 2 and 5 half hours. You choose how long; different routes take different times. Yes. I book skip the line tickets for your tour and we use the tour guide entrance which has no line. These are €20 per person and I book these for you in advance. I then combine these in to the total tour price when I email you. Anytime between 9am – 2pm. Up to 6 people. Any more requires the use of radios according to Vatican bye laws, which I do not provide. Yes, allowed everywhere except the Sistine Chapel. Flash permitted downstairs (sculpture) in the Museum but not upstairs (painting). Yes, to sit down, for bathrooms, drinks etc. You can choose to have a break for lunch or a snack inside if you want. The Vatican Museums, the Sistine Chapel, the Raphael Rooms, Borgia Apartments, St. Peter’s Basilica, the Papal Tombs. You can choose from the form below. I normally use buses, metros and taxis but I can arrange private transport if you like. You choose as you will pay. If you would like to book a tour through me, please fill out this form and it will email me your request. Tours of the Vatican Gardens or Necropolis can only be booked with the Vatican themselves. I will reply to you within 24 hours via email and answer any questions you may have. Once you are happy and want to confirm the tour, I will send you an email through paypal where you can pay a deposit or the whole thing using your credit card or paypal account. You can alternatively pay the guide in cash on the day if you prefer.Then your tour is booked and the guide will see you on the day of your tour. Thank you for providing a wonderful tour of the Vatican – with special thanks to Dara who was an outstanding guide! Spoke excellent English. Loved the headphones. Did not have to keep up to enjoy the tour. Have two teenagers with us and they enjoyed it too! Dara was an excellent guide. His tour was very informative without being too ‘heavy’ and included just the right amount of humour. I’m sure we learnt a great deal more from Dara than if we simply read the guide books. The whole tour experience was incredable and helped to make our brief holiday to Rome a great success. Well Done!! It was a great tour except it was too long without being able to sit down or take breaks. (This is a criticism of the Vatican many people have – there should be more benches – Dara). Dara was outstanding. The tour was sensational and met every expectation we had. Our two teenage boys where very impressed with the tour and thoroughly enjoyed Dara’s commentary, humor and knowledge.